April 12, 2019 at 7:27 am. The Dodgers won the series on their way to a second straight World Series appearance, but neither team is doing much winning lately. The Brewers are coming off three straight losses to the Los Angeles Angels in Anaheim, the first time Milwaukee has been swept since last July. Like the Brewers, the Dodgers won eight of their first 10 this season, but headed to St. Louis after sweeping the host Colorado Rockies last weekend and lost four straight. The Dodgers led 3-0 and 7-4 against St. Louis on Thursday afternoon, but Los Angeles starter Walker Buehler exited after allowing five runs in four innings and the Cardinals chipped away at the bullpen for six more runs. The Dodgers also lost shortstop Corey Seager to a left hamstring bruise after he was hit by a pitch in the fourth inning. Brewers third baseman Travis Shaw left Wednesday’s game with a bruised right hand after he was hit by a pitch in the second inning, though X-rays were negative. The Brewers had Thursday off in Southern California to recharge and they’ll send rookie right-hander Corbin Burnes to the mound in the series opener. Burnes made 30 relief appearances for Milwaukee last season, but has struggled in his first two starts in the majors, allowing 11 earned runs in 10 innings. One double-digit number that gives the Brewers optimism are the 18 strikeouts Burnes has accumulated this season. One main area Burnes needs to clean up is his susceptibility to the long ball. He has allowed three home runs in each of his starts, becoming the first Milwaukee pitcher since Jason Bere in 2000 to allow three or more homers in consecutive starts. Julio Urias will make his third start of the season for the Dodgers before he’s expected to move to the bullpen to lessen the demand on his reconstructed left shoulder. Urias did not receive a decision in either of his first two outings. 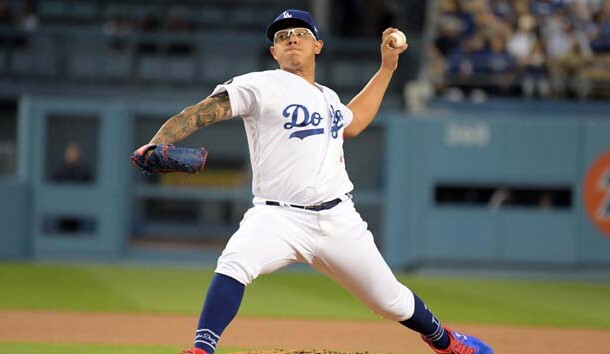 Urias shut out the San Francisco Giants on three hits over five innings in his season debut on April 1 and left with a 2-0 lead, but the bullpen faltered in that game as well, giving up a run in the sixth and three in the seventh in the 4-2 loss. He wasn’t nearly as sharp on Sunday in Colorado, allowing three runs, four hits and four walks over 3 2/3 innings. He didn’t last long enough to earn the win in the 12-6 victory by the Dodgers. Although the Dodgers could use a strong starting effort from Urias, they’re also looking forward to him strengthening their bullpen.